Albeit small but delicious scoops; Orange-Tangerine Gelato and Cardamom Ice Cream, with chopped pistachios and blackberry honey. With our upcoming trip to Paris, and summer right around the corner, thoughts of ice cream have been popping up for us. Since there was a ½ pint of heavy cream left over from Steve’s ice cream creation and only a few days left until it expired, I needed to come up with another flavor to compliment the delicious cardamom ice cream he made a few days earlier. Scouring our cookbooks and seeing what fresh fruit we had in abundance, I found a delicious gelato recipe from Martha’s Classic cookbook. Although she calls for blood oranges I made ours with a combination of naval and tangerine oranges. The result is reminiscent of eating the Creamsicles of our childhood. The orange goes perfectly with the cardamom. 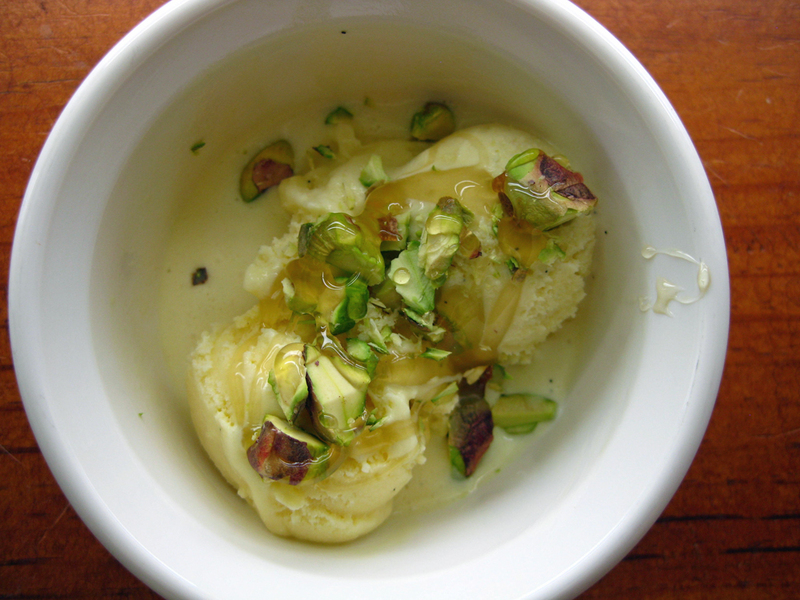 With a few chopped pistachios and a little drizzle of honey, the double scoop makes a simple childhood favorite into a sophisticated palate pleaser. In a medium sauce pan, heat milk and orange zest over a gentle simmer. Remove from heat and let the milk seep for 30 minutes. In a small sauce pan gently heat the orange juice and reduce until only about ¼ cup remains, about 30-40 minutes. Allow the orange juice to cool completely. Prepare an ice bath. Reheat the milk and orange zest. Whisk together the egg yolks and sugar until thick and pale yellow. Slowly add the milk to the egg yolks while whisking, then return the egg and milk mixture to the sauce pan. Continue to heat and stir with a wooden spoon until slightly thick. The custard should coat the back of the spoon. Remove from heat and stir in the heavy cream. Pass the mixture through a fine sieve and place the custard on the ice bath. Stir in the orange syrup and allow to completely cool before pouring the custard into an ice cream maker. Process the gelato according to the manufacturer’s instructions. Freeze in a container. When I gave up on birthday hinting and bought my own ice cream maker I was told I’d only use it a few times and then it would sit and collect dust. But I love it. Just like you, once I’ve made one flavour I have to try another, then another. This Orange one is is now high on my list. Thank you.